This very old hymn, a favorite of people from all denominations, is given a fresh sound by Francisco Ortega. Oh God, who has created all things, seen and unseen, this day is your creation and I give thanks to live in it. I pray that I will not shut you out of the day you have made, blinded by the petty concerns of life, but that I may be always open to your presence. I open my body to you and give thanks for your life that fills and warms every cell of it. I open my eyes and ears to you and give thanks for the light of your Word, without which I would live in the shadow of ignorance. I open my heart to you and give thanks for your love that fills me with compassion, understanding, and peace. I open my soul to you and give thanks for your Spirit, who fills me with wisdom when I take a moment to listen. All that I am, I open to you and I return to you, giving thanks every moment of my life for the blessings that fill this day. Through Christ I pray. O ever watchful Shepherd, lead, guide, and tend me this day; without Your restraining rod I err and stray. Hedge up my path lest I wander into unwholesome pleasure, and drink its poisonous streams; direct my feet that I be not entangled in Satan's secret snares, nor fall into his hidden traps. Defend me from assailing foes, from evil circumstances, from myself. My adversaries are part and parcel of my own nature; they cling to me as my very skin; I cannot escape their contact. In my rising up and sitting down they cause me pain; they entice with constant baits; my enemy is within the citadel. Come with almighty power and cast him out, pierce him to death, and abolish in me every particle of carnal life this day. Everybody hates tax collectors; but there have never been tax collectors hated to equal Roman tax collectors in conquered territories. Some of them were private contractors: they would pay a set amount to Rome and then collect every penny they could, keeping the excess as profit. Taxes were very heavy and were not used for the benefit of JudeaJudea was the name given to the Roman colony consisting of the conquered kingdoms of Israel and Judah, with bits of other nations added.. The people of Judea were halfway to being slaves. And on top of that, Matthew was a Jew — a collaborator with the conquering Romans, a turncoat, a traitor. Matthew's call is only the beginning of it. Jesus and his disciples go on to eat dinner with an entire array of sinners. This simply was not done by good Jews. The majority of Jews in Judea followed the law of Moses; it was a strictly orthodox religion, with fixed, prescribed rules covering most aspects of life. The Pharisees, Sadduccees, and other political-religious sects may have competed with each other, but all of them kept the law. And one very basic law was: they could not eat with unclean people. There were also a great number of Jews who were not necessarily atheists or idolators, but who did not really keep the law, called “people of the land” by the stricter Jews. These are the people referred to as “sinners” in today's passage. While eating with them was not quite as horrifying to a religious Jew as eating with a Gentile, it was forbidden. As we said in the last lesson, Matthew 9 revolves around the early accusations against Jesus. In the first section, he is accused of blasphemy. Here, he is accused of immorality. The Jews, primarily the Pharisees (who predominated in the north and more rural areas), were beginning to build a case against him. But in each instance when they make an accusation, Matthew shows us that it is Christ's goodness and mercy that underly the alleged sin. 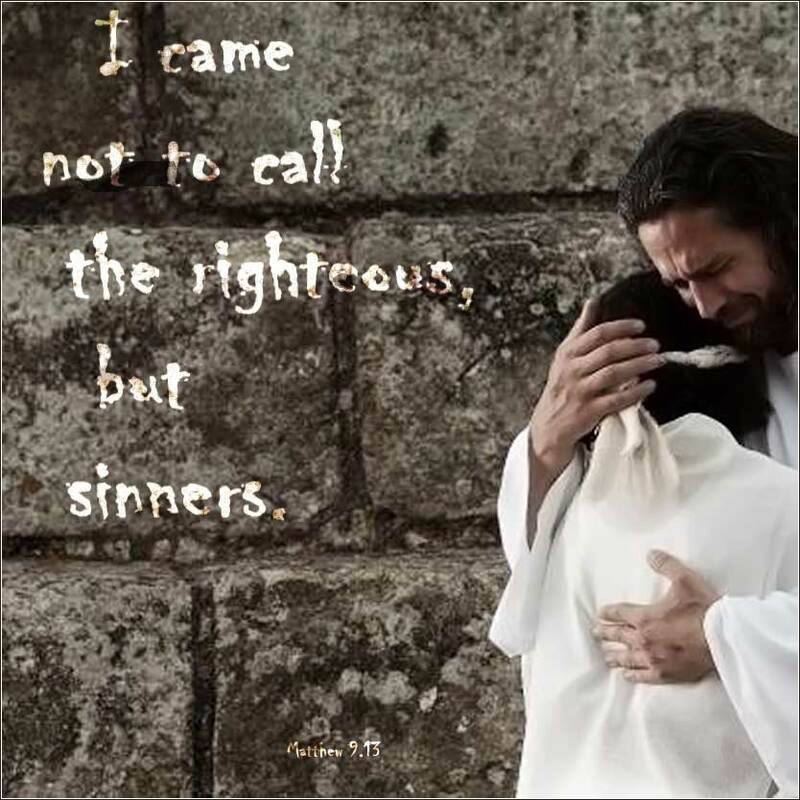 Christ came into the world to save sinners. (1 Timothy 1:15-16) He uses the accusation, then, as a teaching opportunity, to reinforce this critical part of his message. The concept was not, actually, unknown to the Jews: Jesus cites in his defense a passage from Hosea, “For I desire steadfast mercy [or love] and not sacrifice, the knowledge of God rather than burnt offerings.” (Hosea 6:6) Time and time again, Jesus fulfills the law of Moses, by bringing the spirit of the law into full view while breaking an empty, technical aspect of it. 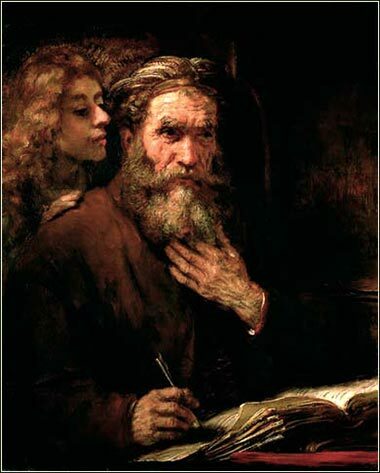 St. Matthew and the Angel, Rembrant von Rijn ca. 1660.